A couple of you have asked me if you can be notified when new comments are posted on a blog entry. I told you "no", but it turns out that, unbeknownst to me, there's been a way to do that all along. When you make a comment on a post, you'll notice that there's a little button at the top of the completed comment which says "RSS". Click there and you'll be able to subscribe to an RSS feed of the comments, just the way you can subscribe to an RSS feed of our blog. If you want to be notified every time there are comments on any post, click "Recent Comments" on the sidebar to the left, then click on the "RSS" button at the top of the page you get sent to. While I'm on a technical note, I'm hoping one of you can help me out with formatting our blog in Internet Explorer. 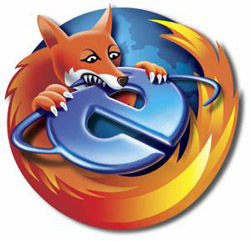 I highly recommend that everyone use Firefox (or, really, any browser except IE) since Firefox is faster, free, and protects you from web-borne viruses. But I'm aware that the 50% of you who use IE get a messed up format from our blog --- the sidebar looks twice as big as it should which makes the pictures eat our words. If anyone out there is adept at finding a way to work around IE's problems with tables, please drop me an email and I'll send you our template to look at. I'd be eternally grateful!